If you are an Orkut user you probably know what I am going to talk about here. I am speaking about Transliteration, which essentially means that you can type in one language and have that converted to another language. Google already offers transliteration in Orkut and many users know about it. However did you know that you can now chat in Indian languages in Gmail and Google Talk Labs Edition also? Follow these steps to chat in Indian languages (currently 5 are supported) in Google Talk. Start chatting with your friend. Convert the chat session to a group chat and invite the particular bot (you added in step 1) to the group chat. As you might be knowing from quite some time you can go invisible while chatting on Gmail. The invisible status is available in Gmail Chat, Google Talk gadget, Google Talk Labs Edition and Google Talk for iPhone . What to do if you want to know if someone in really offline or is playing Mr. Hideous or as we call here in India – "Mr. India" ? If you see a message "The chat is off record" then proceed to step 3, else click on options in the chat window (Gmail) or the down pointing arrow (Gtalk) and choose "Go Off Record" You will now surely see that "The chat is off record"
Now you need to interpret what you get. If you get a message in red like below, this indicates that the user is really offline. If you get nothing then the user is invisible, or any status updates in gray it means the user is online but invisible. Downloading a lot of files these days is very easy and fast! A problem with this is that if you do not do some management, things start cluttering up even faster. Let’s look at one of such management techniques – "The Right Click Send To Menu". In this article we will be customizing the right click menu’s Send To option you get on clicking on a file or folder, plus there will be a few "Send To" tricks! Type sendto and hit enter. The "Send To" folder will open. Then create a shortcut to the My Music folder in the Send To folder and you are done! To Remove an entry from the Send To menu you would just have to remove its shortcut from the SendTo folder. First off just to set things straight Copying a file or folder means that a "Copy" of the file or folder is created in the new location, while Moving a file or folder means that you "Cut" the file or folder and then paste it in its new location. Since we have customized the Send To menu thus we have taken care of all this and we can achieve all this in one single step. Note that these tricks also apply in general when you drag and drop files from one window to another (only you don’t need to right click in that case). Step 1: Navigate to your Firefox profile directory. Yes you have a Firefox profile too incase you didnt know. All Firefox users have it. Its stored in a special folder on your hard disk.You will have to enable show hidden files and folders. For complete steps here is how to find the profile folder if you don’t know how to. The following screenshot shows the location on windows xp. For other operating systems follow the link mentioned in previous line. Step 2: The profile on my machine reads as "l0gyrqu5.default", you will have a similar random string if you didnt create a profile yourself. We will refer to this profile string as xxxxxxxx.default from now on (to avoid confusion coz yours is going to be different, just substitute xxxxxxxx with the random string for your profile). If you want to position your logo at a specific position rather than tiling it all over then find out what your screen resolution is, this will have an effect on the dimensions of the image we use. Lets take the most common 1024 x 768 as our reference. So now the dimensions of our image should be 1024 x 100. The idea is to visualize a rectangle over your Firefox window’s toolbar and see what dimensions will cover the area you want to cover. A good idea is to take screenshot of the window and then draw a rectangle over the toolbar using your image editing software. You will have the dimensions, no need to get too precise we just need a rough estimate. Download the sample image I created with I Love FireFox logo to be used as myImage.png . Step 7: Name the image myImage.png and place it in the chrome directory. Restart Firefox and if you did all things as mentioned you will be greeted by your personalized Firefox edition. Quite often trying to add a search engine to Firefox I end up dissatisfied not able to find the particular search engine or service I am looking for. Compare this to Opera which allows you to create your own search in a snap by just right clicking on the search box that you want to add and clicking create search. There is a workaround for this with Firefox also, however its just a bit more daunting. So I decided to create a Step by Step tutorial on how to do one. Step 1: Identify the search website or the search service for which you want to create the plugin. In this tutorial we will create a search plugin to search torrentz.com a site useful for searching Bittorrent files. Needless to mention that this can change with time and will be different for different sites. Step 4: We will be changing the text that is in bold in the above code to suit our needs. Leave the first two lines as it is. They tell the type of the document and the name space description. The text included between the <Shortname> and </Shortname> is the name you want to give to your search plugin. We will put "Torrentz" here. The text between the <Description> and </Description> gives a little information about the plugin. We will put "Search torrents on Torrentz.com" in this area. Replace encoding with the type of input encoding you will use, if you dont know what is this, then you will most probably be using UTF-8 so put in "UTF-8" there. <Contact> and <Contact> enclose the email address of the mantainer of the plugin. We put "sendinfofiles@gmail.com" here. <Url> is to contain what we had discovered and taken note of in Step 2. Replace the word webAddress with the url we found in Step 2. Click here to view the final file. Feel free to download and make changes. Step 5: Thats it. Thats your very own Firefox search plugin. Did I miss something? If you were thinking "So how you use it or test it?" then pat yourself on the back, it seems you understood the tutorial! For the others please have another look at Step 4. Please note that you will have to enable "Show Hidden Files", user name refers your Windows username, string is a random string generated for each firefox profile. Just open up these folders it will start making sense. Step 6: You are now ready to go, Restart Firefox if it was already running and then choose your newly created plugin from the Search Box and test it. It works I know. You are a genuis! Time for completion: 5 – 10 minutes. Bonus: Did I mention this plugin can work with Internet Explorer 7 also? Yes it can. IE7 supports Open Search Plugins and thats what we just created incase you didn’t notice! This is the Step by step tutorial on installing Linux, just as Mova promised. Refer to the earlier posts on Linux Demystified here and here to know the background of this tutorial. About 5GB free hard disk space. 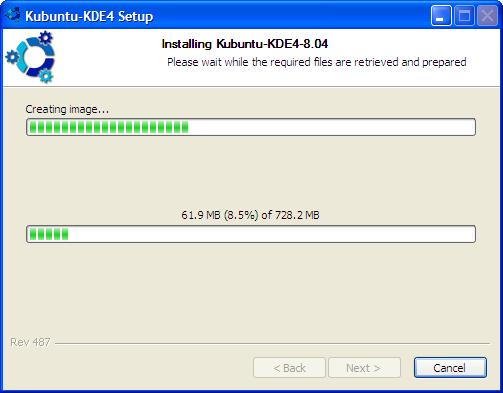 Ubuntu or Kubuntu or Edubuntu cd or a fast Internet connection. Wubi (not required if you have Ubuntu, Kubuntu or Edubuntu 8.04 cd). 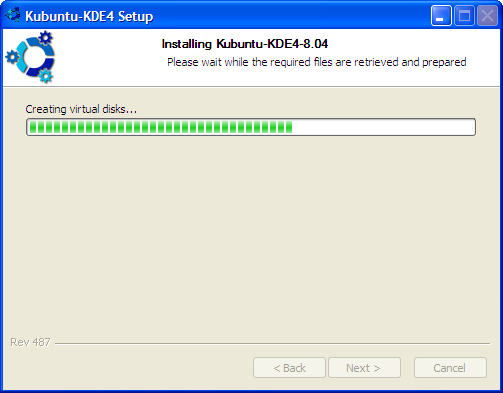 I am using Kubuntu, if you use Ubuntu it would be all the same just the image and colors will be different. 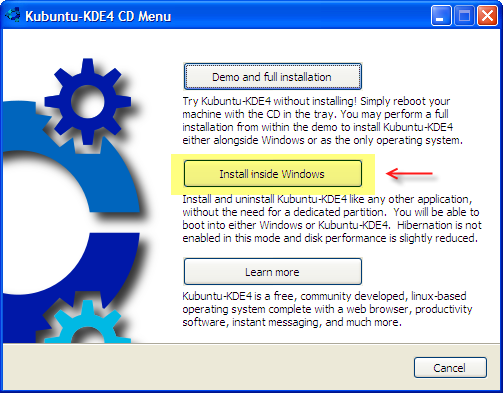 Step 2: Click on "Install inside Windows". You will be greeted by the following screen. This is where all the action is!! Choose the Windows partition where you want to install Ubuntu. 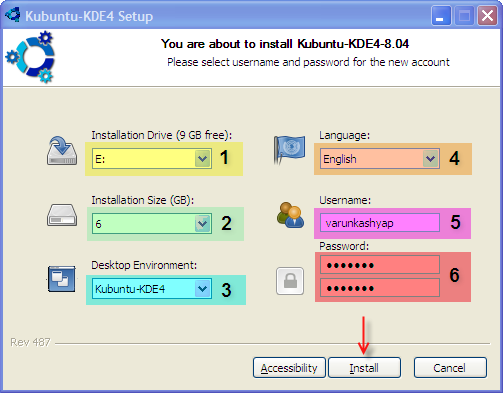 Choose the space you want to allocate to the Ubuntu Installation. Choose Desktop Environment. More on this later. For starters I would recommend Gnome, but then if you know what you are doing, you can choose anyone here. Its no big deal. Choose the username. This will be used to log into Ubuntu. Choose the password for the above username. Both these details are required when you boot into Ubuntu. Now simply click on install, installation will begin as shown below (make sure you are connected to the Internet if you are not doing this from cd), go fetch a Coffee or two!! Step 5: Have another coffee! Wubi will soon complete its work and ask you for a restart. Step 6: You are almost there. Choose reboot now and click on finish. You computer will reboot, but this time its different. You will see an entry named Ubuntu in the Choose Operating System Menu. Use arrow keys to choose Ubuntu ( I often see people trying to use mouse on this screen. It wont work!!) and press enter. 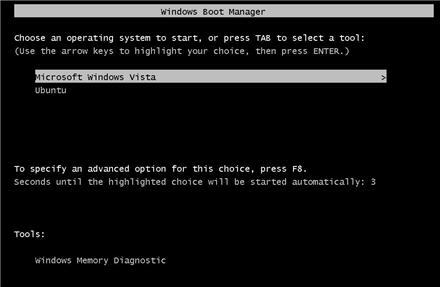 Disclaimer: The above shot is of Vista Boot Manager that I found on Google Image Search ( I dont have a camera good enough to post my own shot). With XP the screen looks almost the same. Just wanted to give you an idea. Step 7: Ubuntu will go through the process of setting up the operating system for the first time. This would take some time depending upon the specifications of your machine. Once its done. You can login into your Linux installation using the username and password you provided in Step 3 above. This is it. You have Ubuntu running on you system and you didnt have to touch any partition of configure GRUB. Enjoy! Most of the things work out of the box. You might have a minor glitch or two depending on your hardware, this can usually be sorted by searching the Ubuntu Forums or check out the Ubuntu IRC at freenode. Time for completion: 30 – 35 minutes depending on your hardware. Feel free to ask any question on any of the tutorials and let me know your experience. Also contribute on what other tutorials you would like to read. I will surely try to include them. Long Live the Ubuntu Spirit! After my earlier post on Remote Desktop Access, I have been asked by friends to explain in detail how to set up Remote Desktop Access. Lets start with the easy one then, shall we? Step 1. Download TeamViewer(full version) here. Step 2. Double click the file downloaded in step 1. You will see the following screen. Step 3. Click next and proceed to the License agreement. You are ready to go!! Never miss an article, Subscribe here, Its Free!